Don't know how much you remember this video, but things didn't change much ever since - at least not for better. Seems that Russia will also soon become first country on the world that will abandon retirement as well(this is just how advanced one is). Russians are accusing their government of raising the retirement age close to men’s current average life expectancy while the country is distracted by its hosting of the World Cup. Prime minister Dmitry Medvedev announced on Thursday the Russian state pension age would be hiked from 60 to 65 for men by 2028 and 55 to 63 for women by 2034. Expected to be officially adopted by next year, the new policy would mean the country’s retirement age for men would be only a year lower than the World Health Organisation’s estimated life expectancy for a Russian man of 66. 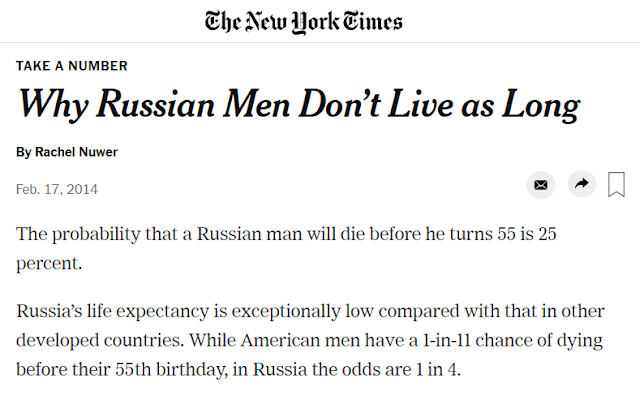 World Bank estimates also had Russian male life expectancy at 66, while the CIA’s World Factbook had it at 65. Women can expect to live to about 77. The Russian Confederation of Labour (KTR) said official statistics showed the average life expectancy of men was less than 65 in more than 60 regions of Russia. It estimated around 40 per cent of men and 20 per cent of women may not live long enough to claim their pensions under the new rules. KTR said in a statement: “The intention to raise the retirement age is not based on available official statistics and does not meet the goals set by the president of the Russian Federation to the government. However, Russia’s Federal Statistics Service projected men’s life expectancy would reach 74 years by 2034, according to Bloomberg News. The Moscow Times reported last year that the Russian government hoped to raise national average life expectancy to 76 by 2025, from its level then of 71. The announcement came at a time many were watching their national team’s 5-0 victory over Saudi Arabia in the opening game of the World Cup, a move that led some to accuse the government of trying to bury the news. 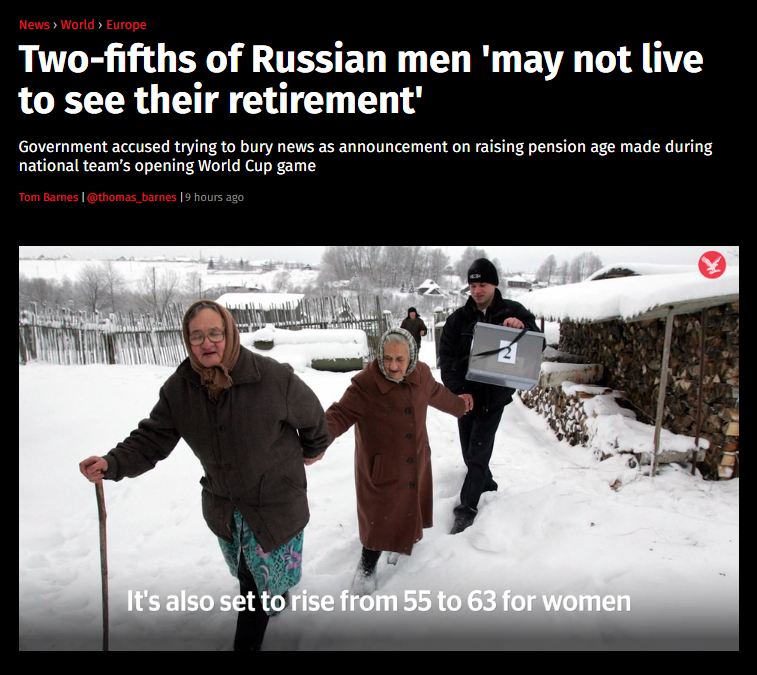 “Under the noise of the opening of the 2018 World Cup Medvedev announced at a government meeting: the retirement age in Russia should be raised to 65 years for men and up to 63 years for women,” wrote Twitter user Yoshkin Mole. Dmitry Peskov, press secretary for Vladimir Putin, said the country had undergone large demographic changes since the Russian president stated in 2005 the country’s retirement age would not rise under his leadership. He added Mr Putin had not been part of the plan to increase the age at which Russians receive their pension. “You are talking about 2005. 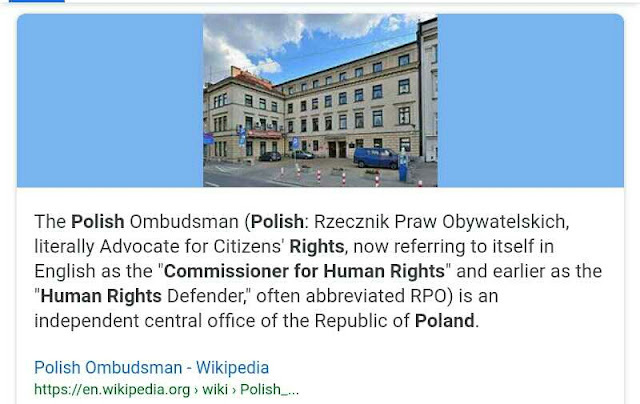 It is important that it was said 13 years ago, of course,” Mr Peskov told independent Russian news agency Interfax. “In the Russian Federation, there have been changes both in terms of demography and from the point of view of the level of economic development, changes in the international state of affairs. No country exists in a vacuum. Mr Medvedev said the measures were “unavoidable and long overdue”, and were designed to kick-start a rise in living standards and economic development, the Financial Times reported.